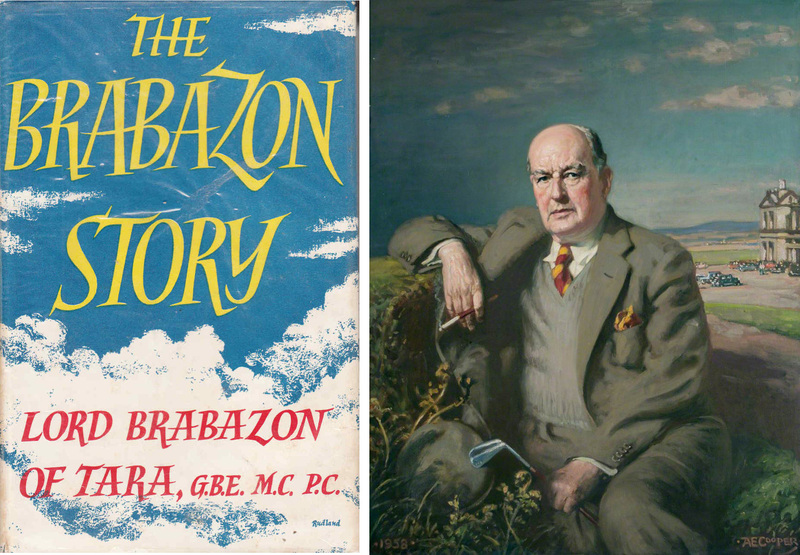 Brabazon – that’s an unusual Irish family name that’s been around for very many generations. In fact, Finola’s maternal grandmother was one. A Jacques le Brabazon was in the service of William the Conqueror in 1066 and the name is said to mean an inhabitant of the former province of Brabant, in Belgium. The current – 15th – Earl of Meath (of Killruddery, County Wicklow), John Anthony Brabazon, claims descent from Jacques. In 1534, Henry VIII sent Sir William Brabazon of Leicester to Ireland to serve as Vice-Treasurer – he founded the Wicklow dynasty. In the troubled Cromwellian times, another branch of the family settled firstly in Ballinasloe and then in Swinford, County Mayo. Earlier this year, Finola and I went up to Swinford for a family gathering and, for the occasion, I had to learn to play the two Planxty George Brabazon pieces by Turlough O’Carolan on my bosca ceol: here they are played – more appropriately – by a harp ensemble. When I first learnt that the name had Irish connections I was fascinated, as I had known the word Brabazon from my early years in England and it’s one of those that is so striking, you just don’t forget it. 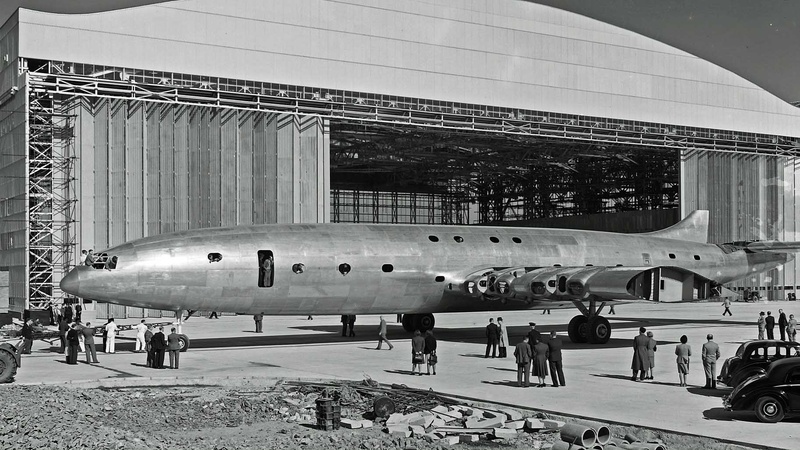 I knew it in connection with an aeroplane – the Bristol Brabazon: it was the largest airliner ever built in Britain, something that impressed this four-year-old boy who saw it flying at the Farnborough Air Display in 1950. Not only was it large – it was elegant: my memory is of a gigantic all-silver bird, rising in a stately fashion over the crowds and disappearing into a blue sunlit sky. I demanded – and received – a model of it for a birthday or Christmas, sadly now gone the way of all such treasures. So, why the name? 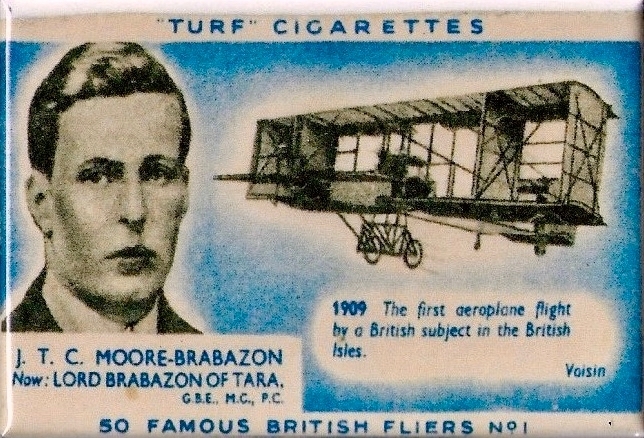 I didn’t know then – but I do now – that it was named after the grandly-styled Lieutenant-Colonel John Theodore Cuthbert Moore-Brabazon, 1st Baron Brabazon of Tara GBE MC PC, who in 1943 chaired the Brabazon Committee which planned to develop the post-war British aircraft industry – one product of which was the factory in Bristol which produced and housed the behemoth. 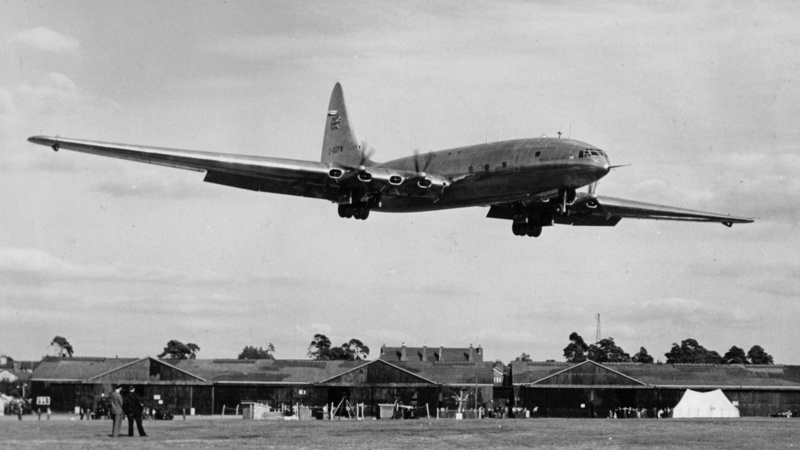 Header – The Bristol Brabazon landing at the 1950 Farnborough Air Display: I was in the watching crowd! Upper – an excellent short documentary on the life and death of the Brabazon Aeroplane project. Above –the enormous Assembly Hangar at Bristol which was constructed to allow the Brabazon aircraft to be built. Outside stands the incomplete fuselage. Brabazon’s Committee correctly anticipated that there would be a major development of civil aviation following the war, particularly for trans-Atlantic crossings. 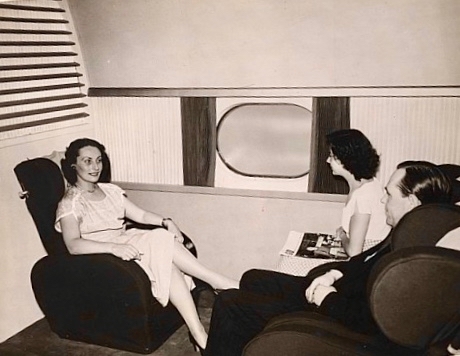 The plane was designed with two decks and luxurious accommodation: each passenger was to have a space equivalent to the inside of a modern car! Consequently the Brabazon had room for only 100 passengers, even though it compares in size to a present day Airbus A380, which can accommodate from 600 to 800 passengers, depending on the configuration. This shows up the fact – which the Committee didn’t seem to anticipate – that air travel would become accessible to all, and not just to those who could afford luxury. Another innovation of the Brabazon was the use of eight engines buried in the wings, coupled in pairs driving four sets of contra-rotating propellers to give a very low noise level in the passenger cabins, again to achieve maximum comfort. That’s probably enough of my obsession with beautiful but impractical aeroplanes. This one ‘didn’t take off’ in that the post-war world wasn’t ready for it: there weren’t long enough runways, service facilities etc. Having been airborne only for publicity events between Bristol, Farnborough, London and Paris, the whole project – and the plane – was scrapped in 1953. Let’s go back to the man himself – John Moore-Brabazon. Although he spent most of his life in the UK he was a descendant through a female line of Edward Brabazon, 7th Earl of Meath. He wasn’t shy of publicity: here he is in 1909 in Kent making porcine aviation a reality. He fixed a wicker basket to a wing strut of his Voisin biplane and carefully strapped a pig into it. The basket had a hand written sign . . . I am the first pig to fly . . . Then he took the bemused animal for a journey of about 3.7 miles from Shellbeach, the Short Brothers airfield at Leysdown on the Isle of Sheppey. Brabazon’s family wealth had enabled him to learn to fly and to posses his own gliders and planes. 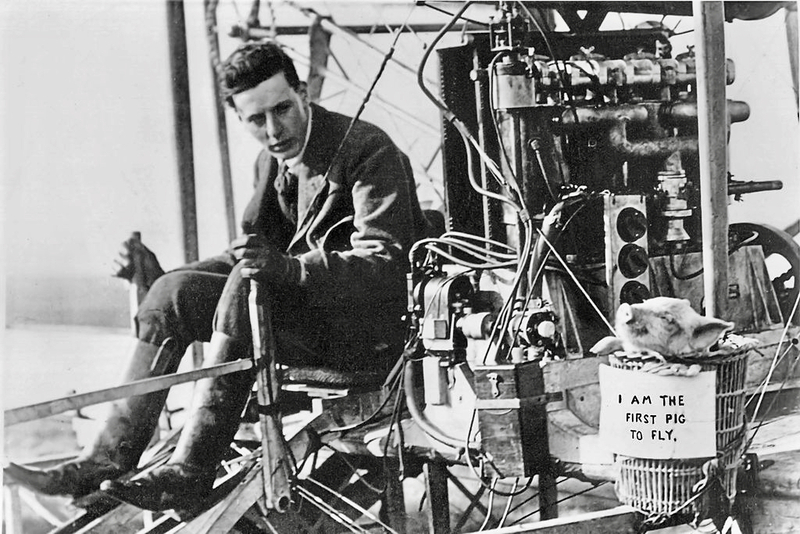 He is noted as the first Briton to fly in Britain and, also in 1909, won the £1,000 prize offered by the Daily Mail for the first closed circuit of a mile in a British aeroplane. He was also the owner of the first pilot’s licence issued in the UK by the Royal Aero Club. In the First World War he was a pioneer of the Royal Flying Corps and had a leading role in the development of aerial photography. 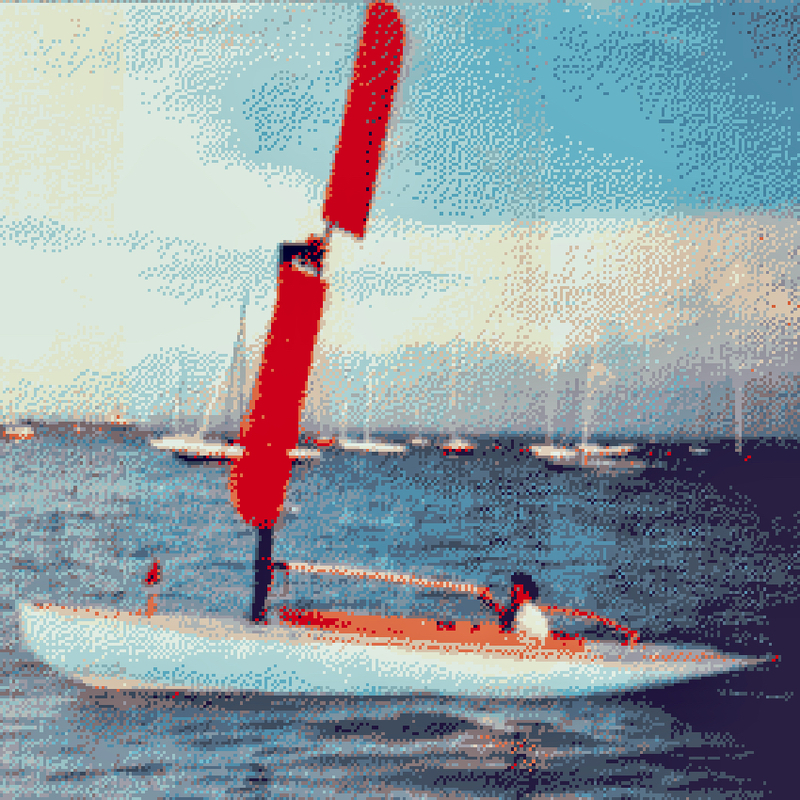 He also raced cars, together with Charles Rolls (of Rolls Royce fame) and was an unconventional yachtsman.
. . . this boat was adapted by John Brabazon in 1933. It is an autogyro, which means that the blades are not driving a propeller – the wind turbine is being used the same way as a sail. This is the earliest autogyro boat that I have found, and I think that we can safely credit Brabazon with the original concept of using the turbine force to drive a boat directly, since all the other people before him had only thought of using the turbine to drive a propellor. After all, the aircraft autogyro was only invented a couple of years earlier in 1930. This boat is called KESTREL, and the hull is an1896 Bembridge Redwing. This class has an unlimited sail plan – you can do whatever you like as long as the area is less that 200 sq ft. So Brabazon tried a whole lot of different sail rigs, including this one, which had a blade area of only 30 sq ft. King George V, who knew a lot about yachts, said “I have never seen a yacht sail so close to the wind”. . . Unfortunately, there was an accident in Cowes Harbour – Lord Brabazon shouted out “Let her go”, and his crew let go of the rotor instead of the boat, and then it could not be stopped, because the brake wasn’t strong enough. It was eventually stopped, after demolishing the next boat along. The moral of this tale is that you should be a bit more specific when giving instructions to your crew . . . The boat was, and remains, dangerous but, as suggested above it was probably the first ever auto-gyro boat. The boat is currently in the collection of the Classic Boat Museum at East Cowes, Isle of Wight, and still ‘sails’. Brabazon had a career in Parliament – both Commons and Lords, however he rather blotted his copybook when in 1942 he publicly expressed the hope that Germany and the Soviet Union, then engaged in the battle of Stalingrad, would destroy each other. Since the Soviet Union was fighting the war on the same side as Britain, the hope that it should be destroyed (though common in the Conservative Party) was unacceptable to the war effort, and Brabazon was forced to resign. His political affiliations were somewhat doubtful in any case as he had been associated with Oswald Mosley before the outbreak of war. Readers might remember my reporting on an Irish dimension to Oswald Mosley in an earlier post.
. . . George Formby & Adolf Hitler on the same record, with Mussolini on backing harmonies apparently . . . A soundscape of the last century starting with the clip clop of a horse drawn cab and ending with the bleep bleep of Sputnik. In between the voices of Churchill, Hitler, Marie Lloyd, Caruso, Gracie Fields and Formby to name but a few. Commentary by Rt Hon Lord Brabazon of Tara whose fruity tones link one voice and sound effect to the next in a weird yet strangely comforting way . . .
An entertaining little taster – hopefully – about somebody who had Irish antecedents, but was essentially an English eccentric.